Curso de Pós-Graduação em Química, Universidade Federal de Santa Catarina (UFSC) Brazil, Núcleo de Investigações Químico - Farmacêuticas (NIQFAR) / CCS, Universidade do Vale do Itajaí (UNIVALI) Brazil, Centro Integrado de Pesquisas Oncohematológicas na Infância (CIPOI), UNICAMP Brazil, Department of Medical Oncology, Dana-Farber Cancer Institute, Harvard Medical School USA, Laboratório de Biologia Molecular, Centro Infantil Boldrini Brazil. Date received February 24, 2006, revised version received May 16, 2006; accepted June 29, 2006; published July 7, 2006. ABSTRACT: PURPOSE: To investigate the anti-proliferative effect of A. blanchetti and A. schottii extracts. METHODS: The anti-proliferative effect of A. blanchetti and A. schottii ethanolic extracts on K562 leukemic cells as well as on BMEC and HUVEC were evaluated. Phytochemical analysis to identify the possible active components was carried out. RESULTS: The root extract of A. schottii was the moust active of them. 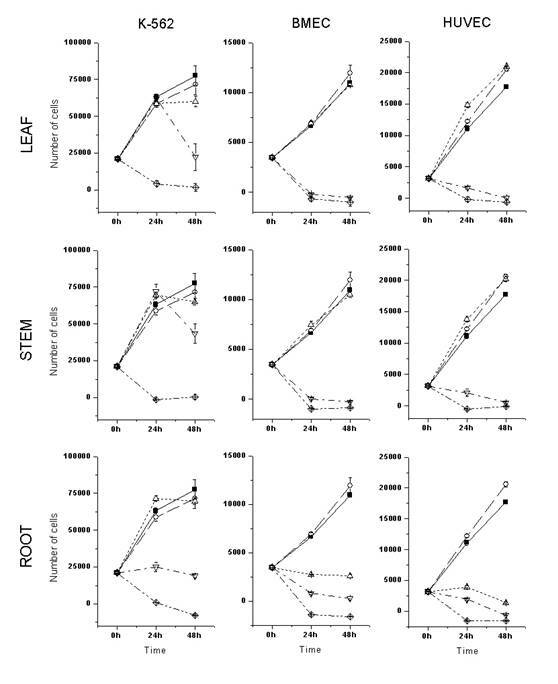 At 80 mg/mL, the root extracts showed a cytostatic effect on K562, whereas at 400 mg/mL, there was a strong cytotoxic effect. Similar cytostatic and cytotoxic effects were seen in the endothelial cells, but at lower doses. The effect of A. schottii root extract on endothelial cells was seen at concentrations ten times lower (8 mg/mL) than the effect of the A. blanchetti root extract (80 mg/mL). Phytochemical investigation of different fractions and parts of the plant led to the isolation of several known compounds, some of which are described for the first time in the genus Allamanda, and with previous evidence of anticancer and antitumoral properties. CONCLUSIONS: Our results suggest that both plants studied exhibit cytostatic and cytotoxic activity, but the most active compounds are located in the roots. Allamanda (Apocynaceae) is a genus of climbing shrubs, which comprises ten species distributed in Brazil (1). Some species, including Allamanda cathartica, A. blanchetti and A. schottii have been analyzed with respect to their chemical composition and pharmacological properties. A. cathartica L. has long been used in traditional medicine for different purposes, including, for example, the treatment of liver tumors (2). A. blanchetti and A. schottii, are commonly used as ornamental plants. Previous work has been demonstrated the presence of the bioactive iridoid lactones plumericin, isoplumericin (3), allamandin (4), plumieride (5), plumieride coumarate, and plumieride coumarate glucoside (6) on A. cathartica. The compounds plumericin, isoplumericin and 5.6-dimethoxycoumarin (unckalin) were previously isolated from A. blanchetti (7), while isoplumericin, plumericin, allamandin, allamacin, scopoletin, scoporone and pinoresinol were obtained from A. schottii(8). Plumericin and isoplumericin exhibited cytotoxic activity against Madison lung carcinoma (M109) (3). Moreover, fulvoplumierin, another iridoid present in plants of the genus Allamanda, demonstrated antifungal, antileukemic, antimicrobiological and anti-HIV properties (9,10). More recently, the anticancer activity of plumieride has been demonstrated (11). The leaves, stems and roots of A. blanchetti and A.schottii, were collected in Florianópolis, SC, Brazil in February and December, 2002, respectively. The plant material was classified by Prof. Oscar Benigno Iza (UNIVALI and HBR) and samples of the specimens collected were deposited at the Barbosa Rodrigues Herbarium (HBR, Itajaí), under numbers HBR 52524 and 52525, respectively. The dried vegetal material was extracted exhaustively with 95% ethanol at room temperature by percolation, for a period of seven days. Solvent removal was carried out under reduced pressure, until the desired concentrations were achieved, in order to obtain the ethanol extracts for use in the pharmacological assays. The ethanolic extract from leaves and stems (68.7 g), which were combined due to their similar phytochemical profile by tlc, and roots (98.4 g), were successively partitionated with hexane, dichloromethane, ethyl acetate and butanol, to obtain the respective fractions, after the removal of solvents. The hexane fraction from the stems and leaves (4.70 g) was chromatographed on silica-gel column with hexane:EtOAc gradient, giving a solid which was successively recrystalized from ethyl acetate/methanol to yield a mixture of b-sitosterol (1) and stigmasterol (2) (14.0 mg). The EtOAc fraction (4.90 g) was chromatographed on silica-gel column and eluted with CHCl3:MeOH gradient, yielding the following compounds: 5,7,4’-tri- hydroxyisoflavone (3) (10.3 mg) (CHCl3:MeOH 9:1), kaempferol (4) (26.5 mg), kaempferol-3-O b-arabinofuranoside (5) (111.3 mg) (CHCl3:MeOH 8.5:1.5) and quercetin-3-O-glucose (6) (17.0 mg) (CHCl3:MeOH 8:2). The CHCl3 fraction from roots (3.3 g) was chromatographed on silica-gel column with hexane:EtOAc gradient. The fraction eluted with hexane gave plumericin (7) (86.1 mg), whereas the elution with hexane:ethyl acetate 8:2 yielded p-coumaric acid (8) (64.4 mg). A fraction called 204-216, eluted with CHCl3: EtOAc gradient, gave eudesmine (9) (10.2 mg). The ethanolic extract from the aerial parts (leaves and stems) of A. schottii (77.6 g) and roots (21.2g) were partitioned with hexane, dichloromethane, ethyl acetate and butanol, as in the previous case, to give the respective fractions. The dichloromethane and ethyl acetate fractions of the aerial parts were combined (20.26 g), since they showed similar chromatographic profiles, and chromatographed on silica-gel column with dichloromethane: EtOAc: ethanol gradient. Fraction 58-75, re-chromatographed as in the previous case, and eluted with Hexane:DCM gradient yielded, after crystallization, a mixture of b-sitosterol (1) and stigmasterol (2) (20.0 mg). Fraction 80-106 eluted with n-hexane:ethyl acetate 8:2 yielded plumericin (7) (56.3 mg) and scopoletin (10) (14.5 mg) when eluted with dichloromethane: ethanol 8:2, and ursolic acid (11) (267.8 mg). Fraction eluted with dichloromethane: ethanol 6:4 yielded plumierede (12) (74.3 mg). The dichloromethane fraction from roots (5.35 g) was chromatographed on silica-gel column with hexane:acetone gradient, furnishing plumericin (22.1 mg) (7), isoplumericin (18.0 mg) (13), 1-(3,4-dimethoxyphenyl)-ethano-1,2-diol (14) (8.3 mg) and scoparone (15.2 mg) (15). The ethanolic extracts (root, steam and leaves) of A. blanchetti and A. schottii were dissolved at 100 mg/mL in Dimethylsulfoxide (DMSO) and kept frozen. Working solutions at 0.04, 0.4, and 2 mg/mL, in culture medium were prepared immediately prior to use. Bone marrow endothelial cells (BMEC) were isolated from donor bone marrow samples using CD105 microbeads (Miltenyi Biotec), according to the manufacturer’s specifications. The CD105 positive cells were cultured in EGM2-MV medium (Clonetics) at 37°C and 5%CO2. Cells with 2 to 5 passages were used in the experiments. Human umbilical cord endothelial cells (HUVEC) were obtained from Clonetics and cultured in EGM2-MV. K-562 cells were obtained from the American Type Culture Collection (Manassas, VA) and cultured in RPMI 1640 supplemented with 10% fetal bovine serum (FBS). In a program to search for Brazilian medicinal plants with anticancer properties, we selected two plants, A. blanchetti and A. schottii, considering some important factors related to the discovery of new drugs from the biodiversity: the abundance of the plants, their popular use, and previous studies (12). Thus, the activities of ethanolic extracts obtained from different parts of the selected plants were assayed on the proliferation and survival of the leukemic K562 cell line or primary cultured endothelial cells, using the MTS colorimetric assay (Promega). 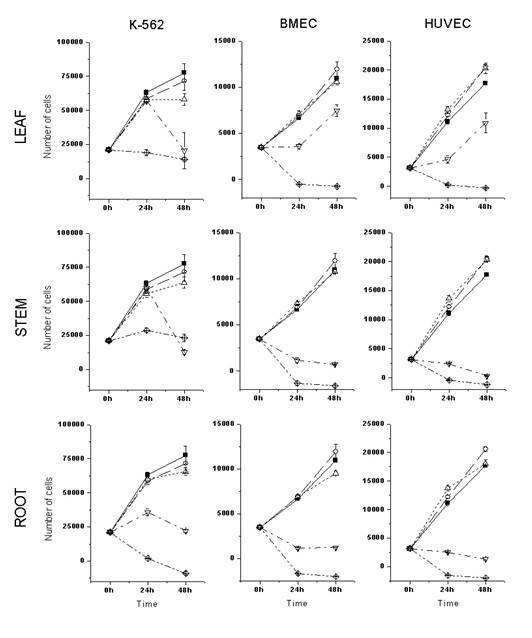 As shown in Figures 1 and 2, the ethanolic root extracts presented higher cytotoxic activity than the ethanolic leaf and stem extracts, in all the cells tested. A. schottii and A. blanchetti root extracts showed similar cytostatic (80 mg/mL) and cytotoxic (400 mg/mL) effects against K-562 cells. In general, endothelial cells were more sensitive to Allamanda extracts than K562 cells.Interestingly, the effect of A. schottii root extract on endothelial cells was seen at concentrations ten times lower (8 mg/mL) than the effect of A. blanchetti root extract (80 mg/mL). Since the effects of these extracts on K562 cells were the same, it is tempting to speculate that A. schottii roots contain higher amounts of a species-specific anti-angiogenic compound. Moreover, it showed a dose-dependent effect, and at such low concentrations of crude extract, that one may suspect a potent anti-angiogenic compound. Increasing evidence suggests that cancer development is associated with angiogenesis (13). The formation of new vessels is necessary to establish continuity with the systemic circulation and nourish the developing tumor (13), and to facilitate the spread of the tumor (14, 15). Since angiogenesis is critical for tumor development, it has been suggested that inhibition of angiogenesis may retard tumor growth in humans (13) . This has led to a redoubled research effort aimed at developing anti-angiogenic cancer therapies. Several anti-angiogenic agents have been identified and produced in recent years (16-21). Angiogenesis is a tightly regulated process in which new vascular structures are formed from pre-existing vessels (14). During angiogenesis, quiescent endothelial cells undergo considerable change in their activity, including proliferation, migration, and structural reorganization, and develop an “invasive” phenotype. Our results (Table 1) show that a very low concentration of A. schottii root extract inhibits at least the proliferation of endothelial cells. Future studies are necessary to define its impact on endothelial cell migration and morphogenesis. Figure 2: Cytotoxic activity of A. blanchetti ethanolic extracts on the in vitro proliferation and survival of leukemic and endothelial cells. See key to Figure 1. Such promising results prompted us to investigate the main components of these plants. Thus, the ethanolic extracts from different parts were successively partitioned with solvents of increasing polarity, such as hexane, dichloromethane, ethyl acetate and butanol, according to the previously described method (12). TLC studies evidenced a similar chemical composition in the leaves and stems, and a significant difference in the roots, confirmed by the biological effects, which were more pronounced in the roots. The use of conventional chromatographic techniques (column chromatography, thin layer chromatography) and spectral data (IR, 1H and 13C-NMR), allows us to determine several components, some of which have well-documented biological properties (see experimental part). The spectral data for all the compounds were identical to those previously reported in the literature. Table 1. Amounts (mg) of each compounds isolated from different plant organs and the antiproliferative effects on leukemic and endothelial cells. (A) Starting amount of ethanolic crude extracts. See methods for details; (B) Dose, in mg/mL at which an effect on the proliferation was observed; * Cytostatic effect at the dose stated. At higher doses, a cytotoxic effect is observed. Although the compounds isolated from both plants are already known, the biological properties related to these plants remain obscure. In this context, it is important to mention some experimental results from the literature, with the components, or related structures, present in the two species of Allamanda studied here. Two of these, ursolic acid (11) and plumieride (12), are well-documented compounds which possess important antitumor properties (11, 22). Several flavonoids, specifically some kaempferol glycosides, caused cytotoxic activity against human leukaemic cell lines in vitro and other cancer cells (23,24). Scopoletin (10) was reported as an active antitumoral agent from Micromelum integerrimum against P-388 lymphocytic leukemia system in mice (25). To the best of our knowledge, compounds 5, 6, 8, 9 and 14 are described here for the first time in the genus Allamanda, contributing to its chemotaxonomy. It is clear from the results that the strong citotoxic activity of the A. schottii root extract is not due to the presence of plumericin, which is present in greater quantity in the roots of A. blanchettii. Studies are now in progress to verify the compounds responsible for the biological effects caused by most active ethanolic extracts. In summary, our results suggest that both plants studied exhibit cytostatic and cytotoxic activity, but the most active compounds are located in the roots. Further studies are needed to determine whether the isolated compound, or other compounds not yet isolated, could hold promise as possible anticancer agents. The authors are grateful to CNPq/Brazil for financial support. J.A.Y. and A.A.C. were partially supported by NIH PO1 Grant CA 68484. J.A.Y. was partially supported by a grant from the Children’s Leukemia Research Association (USA). Joly A.B., Botânica, Introdução a Taxonomia Vegetal. Editora Nacional, São Paulo, Brazil, 1975. Mors, W.B., Rizzini C.T., Pereira, N.A. Medicinal plants of Brasil. Reference Publications, Inc Agonac, Michigan, USA, 2000. Abdel-Kader M.S., Wisse J., Evans, R. van der Werff H. , Kingston D.G. Bioative iridoids and new lignan from Allamanda cathartica and Himatanthus fallax from the Suriname rainforest. J Nat Prod , 60:1294-1297, 1997. Kupchan S.M., Dessertine A.L., Blaylock B.T., Bruan R.F. Isolation and structural elucidation of allamandin, and antileukemic iridoid lactone from Allamanda cathartica. J Org Chem , 39: 2477-2484, 1974. Tiwari T.N., Pandey V.B., Dubey N.K. Plumieride from Allamanda cathartica as an antidermatophytic agent. Phytother Res ,16: 393-394, 2002. Coppen J.J., Cobb A.L. The occurrence of iridoids in Plumeria and Allamanda. Phytochem, 22:125-128,1983. Bhattacharyya J., Morais M.S.Q. 5,6-dimethoxy-7-hydroxycoumarin (unckalin) from Allamanda blanchettii, isolation and 13C-NMR characteristcs. J Nat Prod, 49: 354, 1986. Anderson J.E., Chang C.J., Mc’Laughlin J.L. Bioactive components of Allamanda schottii. J Nat Prod, 51:307-308, 1988. Kardono L.B.S., Tsauri S., Padmawinata K., Pezzuto J.M., Kinghorn A.D. Cytotoxic constituents of the bark of Plumeria rubra collected in Indonesia. J Nat Prod, 53:1447-1455, 1990. Tan G.T., Pezzuto J.M., Kinghorn A.D.Evaluation of natural products as inhibitors of human imunodecifiency virus type 1 (HIV-1) reverse transcriptase. J Nat Prod, 54:43-154, 1991. Dobhal M.P., Li G., Gryshuk A., Graham A., Bhatanager A.K., Khaja S.D., Joshi Y. C., Pandey R.K. Structural modifications of plumieride isolated from Plumeria bicolor and the effect of these modifications on in vitro anticancer activity. J Org Chem, 69:6165-6172, 2004. Folkman J. Tumor angiogenesis: therapeutic implications. N Engl J Med, 285: 1182-6, 1971. Folkman J. , Shing Y. Angiogenesis. J Biol Chem,. 267: 10931-4, 1992. Zetter B.R. Angiogenesis and tumor metastasis. Annu Rev Med, 49: 407-424, 1998. Yamaoka M., Yamamoto T., Masaki T, Ikeyama S, Sudo K, Fujita T., Inhibition of tumor growth and metastasis of rodent tumors by the angiogenesis inhibitor O-(chloroacetyl-carbamoyl)fumagillol (TNP-470; AGM-1470). Cancer Res, 53: 4262-7, 1993. O'Reilly M.S, Holmgren L., Chen C., Folkman J. Angiostatin induces and sustains dormancy of human primary tumors in mice. Nature Medicine, 2: 689-692, 1996. O'Reilly, M.S., Boehm T., Shing Y., Fukai N., Vasios G., Lane W.S., Flynn E., Birkhead J.R., Olsen B. R., Folkman J., et al., Endostatin: An endogenous inhibitor of angiogenesis and tumor growth. Cell, 88: 277-285,1997. Witte L., Hicklin D.J., Zhu Z., Pytowski B., Kotanides H., Rockwell P., Bohlen P., Monoclonal antibodies targeting the VEGF receptor-2 (Flk1/KDR) as an anti-angiogenic therapeutic strategy. Cancer Metastasis Rev, 17: 155-61 1998. Kaban L.B., Mulliken J. B., Ezekowitz R.A, Ebb D., Smith P.S., Folkman J., Antiangiogenic therapy of a recurrent giant cell tumor of the mandible with interferon alfa-2a [see comments]. Pediatrics, 103: 1145-9, 1999. O'Reilly M.S., Pirie-Shepherd S., Lane W.S., Folkman J., Antiangiogenic activity of the cleaved conformation of the serpin antithrombin [see comments]. Science, 285: 1926-8, 1999. Osvena Z., Vachalkova A., Horvathova K., Tothova D.Pentacyclic triterpenoic acids: new chemoprotective compounds. Minireview Neoplasma, 51:327-333, 2004. Dimas K, Demetzos C., Mikatu S., Marselos M., Tzavaras T., Kokkinopoulos D. Cytotoxic activity of kaempferol glycosides against human leukaemic cell lines in vitro. Pharmacol Res, 41:83-86, 2000. Nakamura Y., Chang C.C., Mori T., Sato K., Ohtsuki K., Upham B.L., Trosko J.E. Augmentation of differentiation and gap junction function by kaempferol in partially differentiated colon cancer cells. Carcinogenesis, 26:665-671, 2005. Cassady J.M., Ojima N., Chang C., McLaughlin J.L. An investigation of the antitumor activity of Micromelum integerrimum (Rutaceae). J Nat Prod, 42:274-278,1979.